Thank you to the thousands of supporters from SUN Countries and across SUN Networks who have contributed to this report. 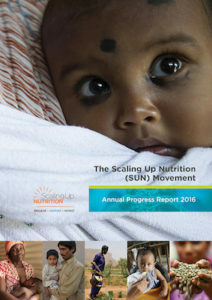 Enriched by the many Joint Assessment exercises carried out across SUN Countries, the 2016 report shares insights about the great strides being made across the Movement to end malnutrition in all its forms. By working together, across sectors and with different stakeholders, we are putting women and girls at the centre of our efforts as we strive to reach the most vulnerable communities and ensure that no one is left behind. Chapter 1: What makes good nutrition so important? Share the 2016 SUN Movement Annual Progress Report with your network! Success! 49 countries now have an active Multi-Stakeholder Platform for nutrition at the national level!